Not only does the property afford incomparable convenience with its location inside the Trudeau International Airport, but its amenities and service outshine those of other luxury airport hotels in Montreal. As a result, this property is redefining the possibilities of jet-setting, one visit at a time. DORVAL, QC--(Marketwired - Oct 30, 2014) - Harking back to an era when air travel was glamorous and fun, the Montreal Airport Marriott In-Terminal Hotel is resetting the bar when it comes to guest expectations. Not only does the property afford incomparable convenience with its location inside the Trudeau International Airport, but its amenities and service outshine those of other luxury airport hotels in Montreal. As a result, this property is redefining the possibilities of jet-setting, one visit at a time. Whether guests stay at this upscale Montreal airport hotel for a layover, a business meeting or a vacation, they will begin their experience in the most stylish of ways. The sleek lobby features a see-through fireplace and flexible seating with vibrant accents of green and blue. The overall result is more than attractive, though. It also invites guests to sit down and stay awhile, whether it's to catch up on emails or chat with coworkers. Complimentary Wi-Fi and a location near the U.S. departures terminal also mean that hotel guests and restaurant patrons can linger until the last moments before their flight. Of course, other features encourage lingering as well. Travel-weary guests can rejuvenate at the AltiSpa, a unique offering among Montreal airport hotels. Whether travellers have time for a quick facial between flights or a full day of treatments, the spa menu includes a range of services like body scrubs, wraps, massages and manicures/pedicures. Additionally, the fitness centre's cardiovascular equipment, free weights and refreshing indoor pool provide energizing ways to stretch one's legs after a flight. And the Bijou Resto Bar, with its regional cuisine and local ingredients, makes the perfect place to grab a bite on the way to the airport, or relax after a day of business or sightseeing. With 20 high-tech meeting rooms, the hotel is also an ideal destination for conferences. And corporate travellers appreciate the business-friendly features of the hotel, from its proximity to local businesses, to the guest rooms' Plug-in panels, large desks, ergonomic chairs and high-speed Internet access. Spacious and stylish, the guest rooms accommodate leisure travellers as well, while Concierge Level rooms offer some of the most luxurious experiences among Trudeau Airport hotels. No matter what brings a visitor to Montreal, whether it's for a few hours or a few days, the Montreal Airport Marriott In-Terminal Hotel is ready to demonstrate just how luxurious modern travel can be. Located directly inside Montreal's Trudeau International Airport, the Montreal Airport Marriott In-Terminal Hotel offers an ideal location for travellers who are flying in or out of Montreal. This AAA 4-Diamond hotel and TripAdvisor's Certificate of Excellence winner offers complimentary wireless Internet access throughout the rooms and public areas, a lively restaurant, business centre, fitness centre, indoor pool, concierge service, laundry service and valet parking. 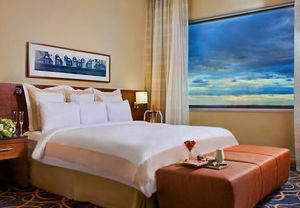 The 272 guest rooms and seven luxurious suites feature comfortable beds with down duvets and fluffy pillows, as well as 32-inch, flat-screen TVs and free movie channels. Enjoy a fine meal made with farm-fresh, local ingredients at Bijou Resto Bar, or unwind with a luxurious treatment at the AltiSpa. With 20 meeting rooms and over 14,000 square feet of meeting space, the hotel is the ideal venue for events in the Montreal area. The Montreal Airport Marriott In-Terminal Hotel is also just a quick drive from downtown Montreal's great restaurants, shops and attractions, like Cap Saint-Jacques Park, Pointe Claire Village, the Morgan Arboretum and the charming historic district of Old Montreal.